Whisky tastings are highly entertaining and educational events, enjoyed with groups of friends and fellow whisky lovers. Varying themes can be accommodated such as Single Malts, Blended Whiskies, Islay Malts, Speyside Malts, Scotland Only, Bourbon, Rye – the list goes on with the possible variations of Whisky tastings. All whiskies taste differently due to a number of factors, the area of production, the grain, the distillation process, the time and method of ageing will all play a serious part in the final nose, taste and appreciation of every whisky. One thing is a constant, the vessel that is required to transfer the wonderful liquid into the mouth to taste the amazing Whisky. The glasses that have been used over the centuries for drinking whisky have been wide and varied, all designed in their own way to both enhance the nose and the taste of the spirit. The traditional ‘Old Fashioned’ cut crystal ‘rocks’ glass which was originally invented for Brandy and soda accompanied by ice, has in recent years been superseded by a varying amount of distinctively shaped glasses designed to make the entire experience of nosing and tasting whisky, a much more pleasing and enjoyable. 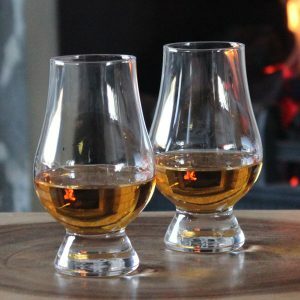 Just like with Wine, there are many different Whisky glasses in existence but our favourite, tried and test is the Glencairn Official Whisky Glass. It’s just 114mm high and holds 170ml in capacity, it’s a very effective nosing glass that fully enhances all the aromas and the shape is also ideal for distributing the liquid into the correct part of the mouth for the perfect taste experience. An alternative glass to the award winning Glencairn glass is their copita nosing glass, this is supplied to blending labs and whisky producers across Scotland which is based on the traditional Sherry Copita. Unlike the Official Glencairn Whisky glass which has a solid foot, the Copita features a short stem and tulip shaped bowl. 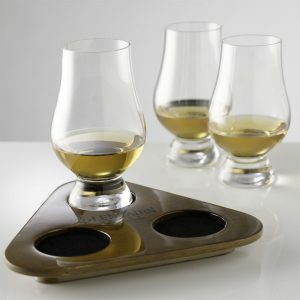 Glencairn also have a few accessories to go along side their award winning whisky glass, the Whisky Flight Tasting Tray is a great example of maximising your whisky drinking experience. The flight trays are made from rubber wood (Chinese Oak) and have specially designed slots for the glasses to sit in the tray, they’re easy to serve with, easy to store and even easier to clean! There;s two different options, firstly with 3 of the official Glencairn whisky glasses and alternatively with 2 glasses and a water jug. Another handy accessory is the Glencairn whisky glass cap, this sits on top of the official whisky glass and it’s designed to trap the vapours from the whisky, giving greater concentrations of aromas when nosing the liquid, ideal for tastings. Whether you’re just a fan of the occasional drop of Whisky, or you’ve always fancied yourself as a bit of a whisky connoisseur, we definitely recommend Glencairn a go!